Dogs are well known for being loyal companions to their owners right until the very end, and this picture just epitomises that. 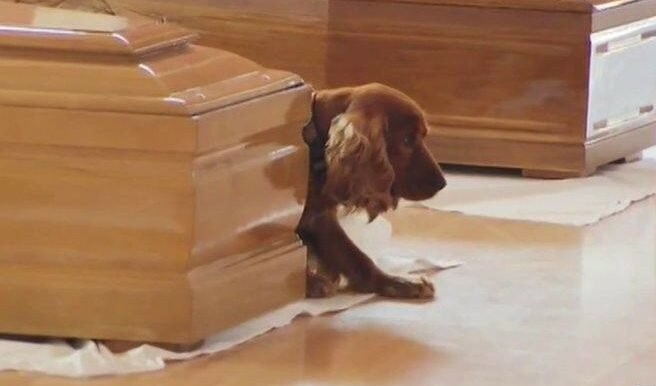 Since the devastating earthquake which hit Italy, killing at least 290 people, this blonde cocker spaniel has not budged from the side of his owner’s coffin. Utterly heart-breaking stuff. In the tear-jerking photo the dog stares directly in front of him, refusing to move away and guarding the body moments before a mass funeral. All that’s known about the owner is that theirs was one of the 34 caskets lying at a gym in Ascoli Piceno. It’s believed the victim came from Accumoli, which was one of the worst effected places hit by Wednesday’s 6.2 magnitude quake. The Italian government declared today as a national day of mourning, with President Sergio Mattarella set to attend a state funeral. Meanwhile, Prime minister Matteo Renzi has declared a state of emergency, with authorities being allowed to use an earthquake relief fund of an estimated 50 million euros (£43m).